Some people are using old books to create works of art, including sculptures. They can change the shape of a hardcover book so it becomes three-dimensional, for example. The resulting sculpture has not only a length and width, but depth. The process can be very simple, and the result is often beautiful. There are many kinds of book folding. Artists fold, bend, and sometimes cut, a book's pages while keeping them together. The art work can be hung on a wall or placed on a table. "They look impressive on the wall," says writer Candice Caldwell. "A group of six of these on the wall together can look really beautiful, and they're just really simple folds." Caldwell operates a blog called the "ReFab Diaries." She writes about re-purposing everyday objects like books for uses other than what they were designed for. In 2003, Caldwell was making clocks from old books when she saw plans for a simple book-folding project in a do-it-yourself magazine. She tried it. She has since taught several friends and her mother how to create wall art from books. Clare Youngs has written a book called "Folded Book Art." She says book folding is easy. From her home in England, she told the Associated Press by email that "it looks as if it is complicated and unachievable, but it is really easy to do. You just don't tell anyone how easy it is and they will be amazed at your creations." 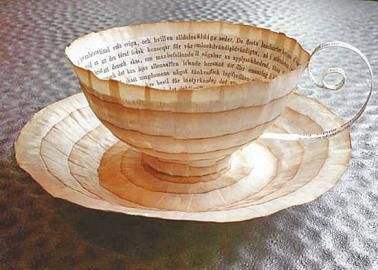 Youngs began making art from book pages several years ago when she saw pictures of folded books at the website Pinterest.com. She also watched some videos on YouTube that tell how to create art from books. "It is quite a therapeutic activity," says Youngs. "...it's very satisfying to see the shape develop." An American book folder defends the activity against those who say it is an act of destruction. Ann Martin of Delaware has written a book called "All Things Paper." She says "sometimes old books are better-suited for a new purpose. I feel it's OK to go ahead and take that old, unused book that's going to be tossed anyway and turn it into a work of art." Caldwell suggests folding cooking recipe and photography books. She says that "if it's really visual and really colorful when you start to fold it, you get a whole new look on the wall." The British driver was unable to hang on to his lead. If you enjoy cooking, here is a recipe of Yuanxiao for you. Why must you do everything as if you have to win? 1.A group of six of these on the wall together can look really beautiful, and they're just really simple folds. On the way home we shared our first class compartment with a group of businessmen. 2.An American book folder defends the activity against those who say it is an act of destruction. Power is in some measure an act of will. The President described the disaster as an act of God.